Posted by AnnaTheRed in how-to (all), how-to - decorations/basic stuff. I often use “Japanese style hamburg” for my bento. That’s because it’s just so easy to make different shapes with it. Sometimes it’s shaped like Makkurokurosuke, sometimes it shaped like a cube (see “Super Smash Bros. Brawl bento”, “Professor Layton bento”), sometimes it’s shaped like a rabbid. 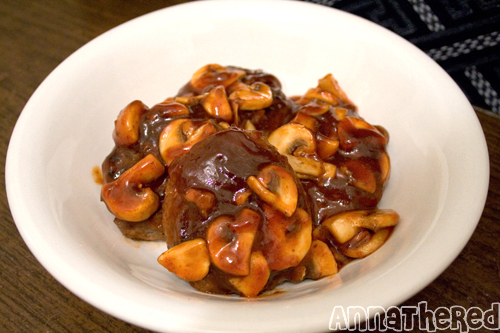 (see “Raving Rabbids bento” ) I call it “Japanese style hamburg”, but I guess it’s a lot like Salisbury steak. 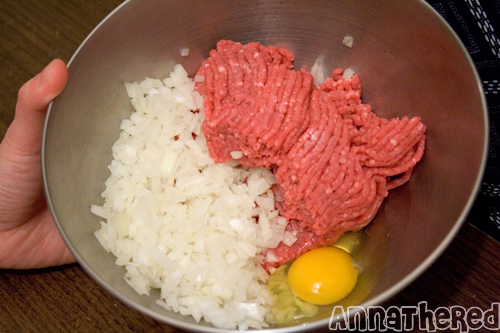 I got a couple of emails and also a comment asking me how to make them, so I’m going to do how to make Japanese style hamburg today. You can find many recipes for Japanese style hamburg online, but I’ll post my version of hamburg recipe. – 1/5 cup of milk if you have any. 1. 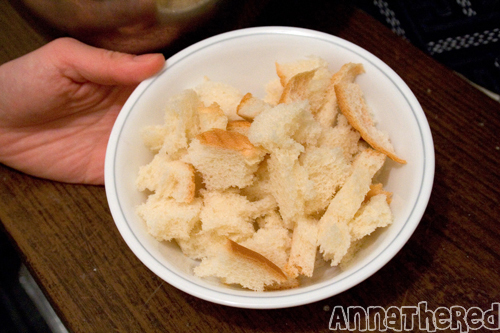 Tear up the bread with your hands. You don’t have to make it small. 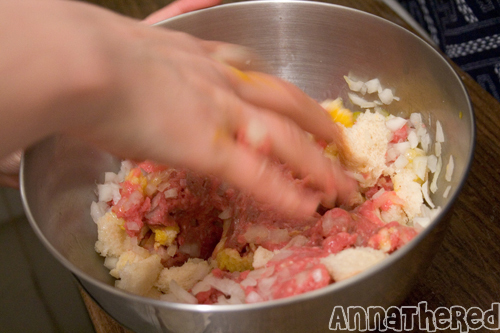 You can also use panko (Japanese bread crumbs) instead of bread. I just use whatever I have. Since my boyfriend is lactose intolerant we usually don’t have milk in the fridge. So I don’t put milk, and I don’t even substitute with water either, but it tastes fine. Don't be afraid to get your hands dirty. 3. 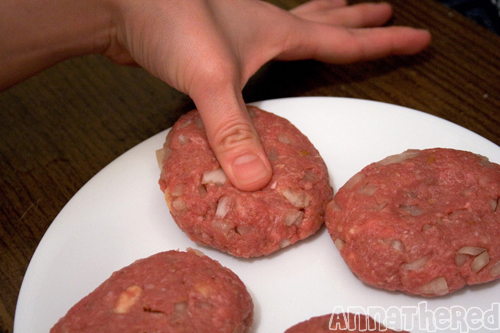 Shape into an oval patty, and throw it from one hand to another a couple of times. I’m right-handed, so I’d throw the patty into the palm of my left hand, like a baseball player throws a ball into his glove. This is to remove the air from the inside the patty. The air inside the patty will cause the hamburg to expand and crack open. You still can eat it, but it might fall apart when you try to move it. It's hard to see, but this is me throwing a patty to my other hand. 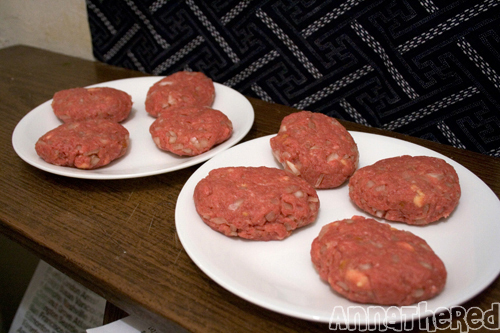 If you're shaping the patty into something other than oval, you can do so after removing the air from the patty. 5. 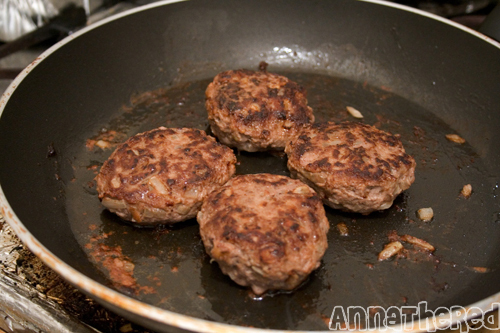 Put a little bit of oil in a pan, and cook the patties over medium-high heat until both sides are brown. Stick a toothpick in the patty, and if you see clear liquid coming out of it, then it’s done. You can stop it here, and eat it with BBQ sauce or ketchup or whatever you like, or you can eat it plain too. 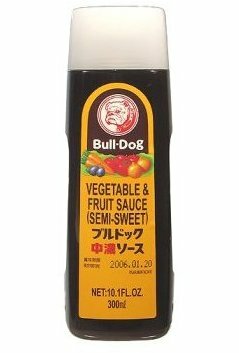 I usually don’t put sauce on hamburg when I’m putting it into bento, because it gets too messy. But I did use hamburg with sauce for “Portal bento” and “Toon Link bento.” I just had to be really careful putting it in the bento box. 7. 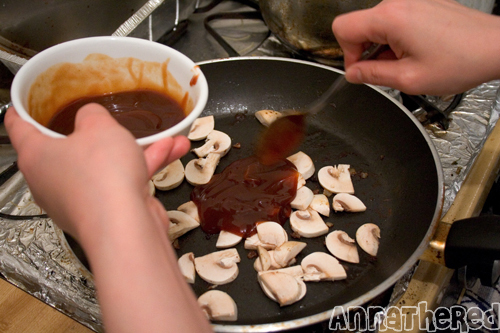 When the sauce starts to boil, lower the heat and put the hamburg in and mix with the sauce. Just like my grandma used to make! Some people might find the sauce a little too strong or sweet, but that’s because Japanese style hamburg is meant to be eaten with rice. Well, this post isn’t really “how-to bento”, but since I do make many little hamburgs for bento, or make characters with hamburg, I thought it’d still fit into the category. 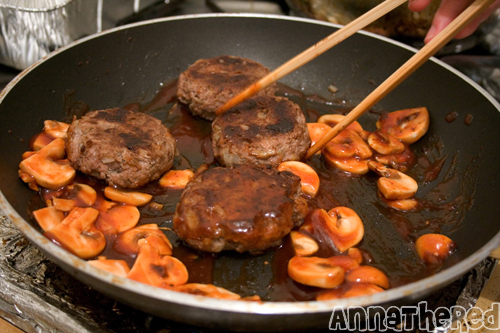 You can see more pictures of “How to make Japanese style hamburg” on my flickr page. If you have any questions about any of my how-to’s, please feel free to leave a comment or email me! Great tutorial as usual!! Happy Chinese New Year!! I thought that was a great tutorial. 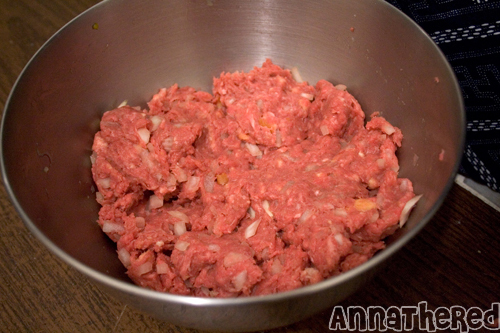 Lol although here we just call that meat loaf patties. 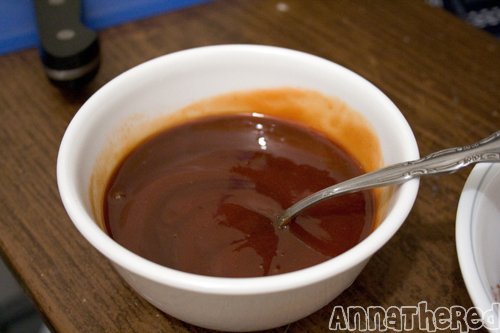 They are pretty popular with just covering the tops with a little ketchup or bbq sauce. This looks great! I’ll have to keep an eye out for that sauce! If you are gluten-intolerant you can use a boiled potato instead of the breadcrums, just mash it up with a fork.